Northwest Austin Real Estate - buy - sell - invest: North and Northwest Austin Homes: What you get for the Money- $300,000-$400,000. North and Northwest Austin Homes: What you get for the Money- $300,000-$400,000. In an earlier post, I discussed what you can get for your money in NORTHWEST AUSTIN HOMES: Hunters Chase and Milwood Subdivisions. Hunters Chase and Milwood are great areas to live and I am a resident there myself. It appeals to first time home buyers as well as couples or small families. As people move up in their career and/or their families grow, they start to think about moving up. This is where we would play the theme for The Jeffersons if this was on TV (Movin' on up...to the East side) Here in Austin, you don't have to move to the East side (unless you want to)***. Many people would like to move to a bigger home or a swankier area or both but still be close to work and the restaurants, shops and schools that their family is used to. Well, Northwest Austin is great for that. Less than five miles from areas that are great neighborhoods for first time home buyers and young families, there are great neighborhoods for move-up families. A move-up family is one or more people that own a home that they would like to sell and purchase a newer and/or bigger and/or fancier home. Today I am going to focus on three general areas in Northwest Austin that are great for people looking to spend $300,000-$400,000 on a home. We will look briefly at what you can get in the areas of Great Hills, Canyon Creek and Balcones Village. There are other areas with a small concentration of homes in this price range like Balcones Woods and Jester but these are areas that have a good number of homes available in this price range. Great Hills Austin Homes: This area is Southwest of the intersection of Hwy 183 and Loop 360. The homes are all around the Arboretum area. This area is all about location, location, location. Being close to the Arboretum means you are close to shops and restaurants and Great Hills is a golf course community with a lovely country club. Most of the homes in this area were built in the 80's and early 90's. For $300,000-$400,000 you can purchase a beautiful home with updates that is most likely 2000-2500 sq. ft. There are homes that are available that back to the golf course in this price range that may need some updates. This area is closer to Central Austin than Hunters Chase and Milwood so much of the difference in price is based on location and some of it is based on quality of construction and updates of the homes. Canyon Creek Austin Homes: This area is South of R.R. 620 and West of Anderson Mill Dr. A majority of these homes were built from the late Nineties through 2005 or so. For the money here you can get a newer home than you would be able to in Great Hills and the home size is more likely to be around 3000- 3500 square feet with a larger yard. Homes are constructed well and this area has continues to appreciate in value because it is close to the lake and it is still easy to commute into Downtown or Northwest Austin area employers. 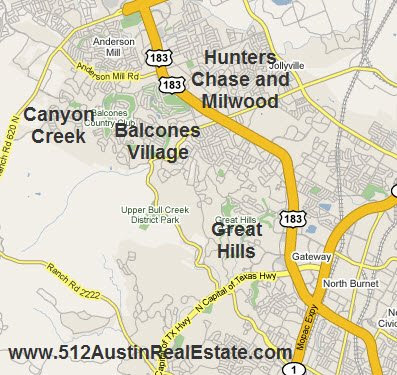 Balcones Village Austin Homes: This area is directly across Hwy 183 from Hunters Chase and Milwood. This area was mostly built out in the 70's and early 80's. A majority of what you can buy at this price point is going to be homes on about 1/3 acre lot that are about 2500-3000 square feet and some homes are on the Arnold Palmer designed Spicewood Golf Course. These homes are charming and were made with a solid construction. Each of these areas have a unique character and make for a great place to move up to a larger home. It is basically a matter of preferences to where a buyer should choose a home. The most important thing is to feel good about the decisions you make when purchasing a home. If you are thinking about selling your home and buying another to move up to, contact me today to ask about my "Move-up" special that will save you money! ***If you are interested in Moving on up to the East side, check out a great post by a fellow REALTOR Garreth Wilcock about what you can buy for $300,000-$400,000 in the Mueller Austin Development.